This magazine isn't really in very bad shape; I just don't usually deal in periodicals. I love this cover. I can't really make the name of the illustrator out, but it looks like Robin Dickey. I just can't get away from the cats and dogs. 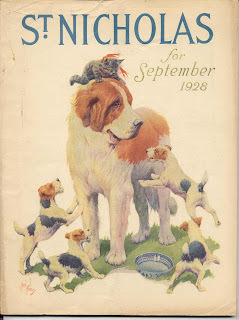 Funny, the big dog looks like a St. Bernard and the puppies look like Jack Russell Terriers. Ya think? I don't think they're supposed to be puppies...it looks like one St. Bernard protecting a kitten from a bunch of Wire Hair fox terriers. Oh, I think you're right. Thanks!